Animal Hospital of Lake Villa is a multi-doctor, AAHA accredited practice that provides preventative, surgical, and diagnostic services to its patients. We’re a highly passionate group of individuals who values the importance of practicing the very best medicine delivered with the utmost compassion. We believe in reducing the fear, stress, and any anxiety our patients may experience during their visits. Our rock stars are required to become Fear Free Certified and use the Fear Free approach with every patient. We offer a full range of services including diagnostic testing, digital radiograph, video otoscopy, ultrasound, laser therapy, surgery, preventative care, and dental care, cleaning and oral surgery. Animal Hospital of Lake Villa is located between Chicago and Milwaukee, there’s tons to do in this area. We’ve got amazing sights to see and a roaring nightlife less than an hour away in each direction. Prefer a nature landscape? No problem! Being surrounded by lakes, beaches, and dog parks makes our location the perfect scenic escape for all nature lovers. Looking for thrills? Perfect! Six Flags Great America is only a 15 minute drive from Animal Hospital of Lake Villa. 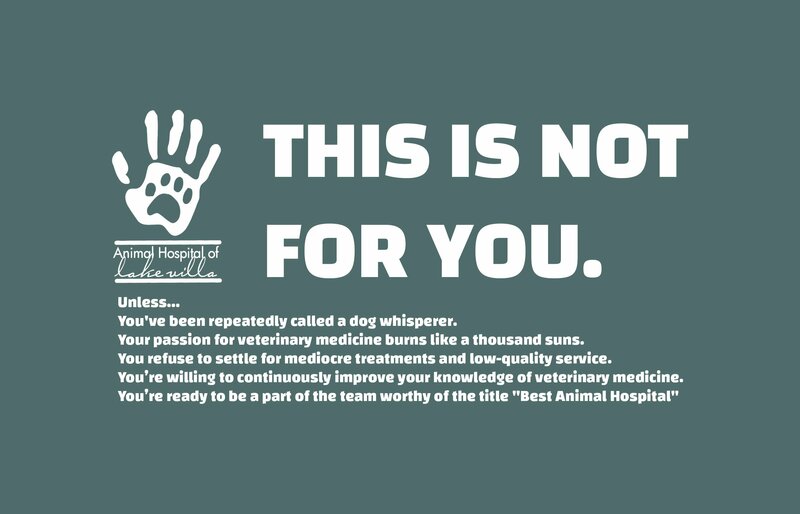 Voted “Best Animal Hospital” through the Daily Herald’s Reader’s Choice Awards and “Neighborhood Favorite” through the Nextdoor App, Animal Hospital of Lake Villa only hires the best of the best. That doesn’t always mean the fancy college degrees or years of experience. We’re not afraid of showing you the ropes or mentoring you on your path to success, you just need to ask yourself… Do you have what it takes? Download our application from our website at www.lakevillavet.com and submit it to ahlvjobs@gmail.com today!